Food is an indispensable part of travelers’ hiking trips to a place. The deliciousness in the place will remain in the heart of tourists, also a gift meaning that the gifted people find where to hang. Nha Trang is a sea tourism city known. 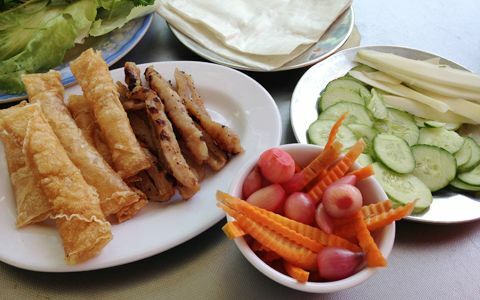 Good food in this coastal city has spread, and visitors to Nha Trang cannot stop, even once to enjoy the delicious. Besides, local people are also very delicate in choosing good food. Mr. Dang Van Quyen, who inherited the nem of the grandparents, parents decided to make the journey to bring Nem Ninh Hoa into Nha Trang. And in 1987, when he rented a house 15 Le Loi – Nha Trang and began introducing barbecue nem chua noodles to Nha Trang and tourists. At that time, people still visit his rolls and call the familiar name is Nem Le Loi. Three years later, the owner took back the premises of Vu Thanh An, 15 Le Loi, he moved to 16A Lan Ong to create the brand name Dang Van Quyen (Le Loi old) until today. There is a story that people enjoy past noodle Dang Van Quyen in Le Loi street, to live abroad, do not know that he has changed places, to the old place is still selling spring. They went to find him and was happy to meet his old friend.